The CEFP is the only facilities credential that focuses on your professional development, and APPA supplies you with the training and tools to make your CEFP credential a reality. Interested? Don’t let the cost stop you. CAPPA is offering its members discounted pricing to become certified. The CEFP is the only facilities credential that focuses on your professional development. And APPA supplies you with the training and tools to make your CEFP credential a reality. This package includes the online prep course, prep manual, Body of Knowledge access, Customized Interactive Learning study groups as well as various online testing options, plus if at first you don’t succeed, a free 2nd test attempt within 30 days. 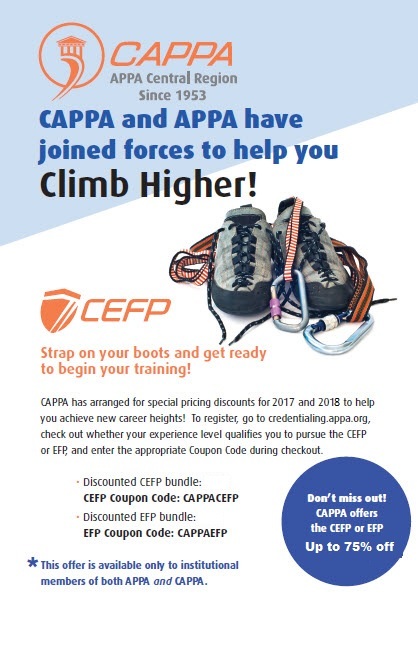 CAPPA members can take advantage of the great APPA + CAPPA Credentialing agreement that drastically reduces the cost for EFPs ($1100 value) and for CEFPs (normally $1300) for 2018. CAPPA COUPONS ARE LIMITED TO 3 PER SCHOOL PER FISCAL YEAR (4/1 through 3/31). To take advantage of a CAPPA coupon, simply visit APPA’s Credentialing site and click on the PURCHASE tab, select the Exam option you wish to take and then you will be asked to sign in. Enter the appropriate Coupon Code (CAPPACEFP for the CEFP Exam Package, or CAPPAEFP for the EFP Exam Package) to apply the CAPPA discount, enter your billing information, then submit. You will get a confirmation email from APPA once your registration is complete. You MUST be an APPA and CAPPA Member to be eligible for this special rate. To find out more about the CEFP program, contact Kelly Ostergrant, Credentialing Coordinator at [email protected] or click on the link - CEFP. Please submit your articles/announcements for the newsletter to editor Jenny Cundiff. CAPPA is the Central Association of Physical Plant Administrators in institutions, or systems of institutions, which meet the eligibility criteria of higher education, technology, or PK-12. We are a regional chapter of APPA consisting of: United States (Arkansas, Kansas, Missouri, Nebraska, North Dakota, Oklahoma, South Dakota, Texas); Canada (Manitoba (Province), Nunavut (Territory)); United Mexican States (Aguascalientes, Coahuila, Colima, Guanajuato, Guerrero, Hidalgo, Jalisco, Mexico, Michoacán, Morelos, Nuevo Leon, Puebla, Queretaro, San Luis Potosi, Tamaulipas, Tlaxcala, Veracruz, Zacatecas; Mexico City (Federal District)). Administrators in adjoining states and provinces, even if in another APPA regional association, may elect to join CAPPA. 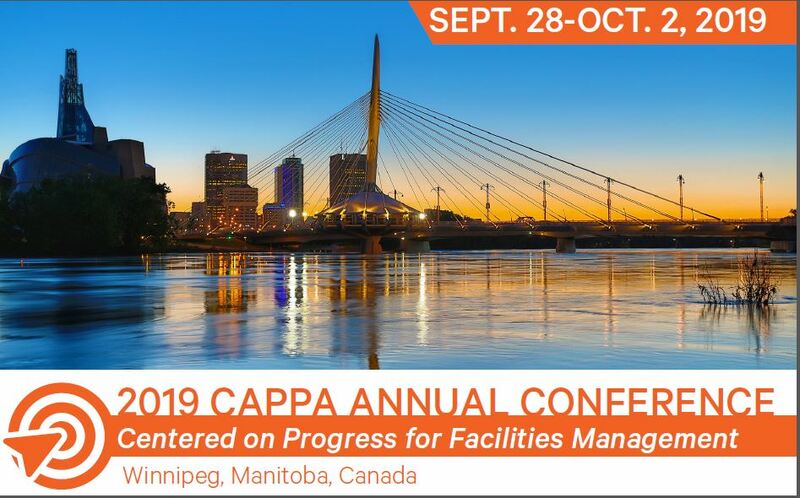 CAPPA's purpose is to develop and maintain high standards in the administration, maintenance, operation, planning, and development of facilities management in educational institutions; to promote professional ideals and standards to better serve the objectives of education; and to supplement and assist the work of APPA in the Central region.